If you are thinking about buying a full fledged powerful sound bar system, then you have found it here. Yamaha YAS – 101BL is a simple but powerful sound bar system that can meet all your needs without making you pay a good fortune. It’s a single speaker home theatre sound bar system that is backed up with an integrated powerful and high quality subwoofer. Take your entertainment experience to a whole new level with this powerful and one of the best sound bar system. Yamaha YAS – 101BL has got everything you desire – a powerful sound bar system, elegant and sleek looks, and high quality surround sound and last but not the least – an affordable price tag. The main key terms associated with the Yamaha YAS – 101BL are elegance and simplicity. This doesn’t mean that compromise on the quality is made anywhere. 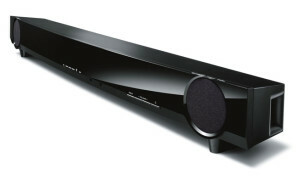 With this particular Yamaha Sound Bar you get a great balance on the quality and the price. This system, one of the best sound bar system, has two integrated high quality front speakers and a built in subwoofer. Yamaha YAS – 101BL combines the power of two – two and a half inch cone speaker with a dual driver subwoofer. The power pack produces an output of a whopping 120W. Although it might seems that a compact device will definitely sacrifice the loudness but this is not true with the Yamaha YAS – 101BL. Its compact design is developed through thorough insight and it still ensures that the sound quality is not compromise. The overall result is the high level of entertainment – better quality movies and music. Its powerful subwoofer unit produces high quality bass sound. The dual driver subwoofer comprises a pair of large magnet and a large voice diaphragm that produces loud and clear bass sounds. This improves upon the overall movie experience making the sound effects almost realistic. A common problem with even some of the best sound bar systems is that even though the speaker used is of high quality, but by coupling it with a poor grade grill the quality is hampered. Yamaha Sound Bar systems make sure that you get the best for what you pay. That’s why this compact device is equipped with the Saran Net Grille that allows seamless fluidity to the sound waves and there is no loss in the quality of the sound. Need deeper and richer bass? No problem, Yamaha YAS – 101BL has a bass reflex port that is designed so effectively that is minimises the loss in the quality next to none. To be more specific, its trumpet like shaped duct outlet reduces the wind noise to improve upon the quality of the sound and especially the bass. The Yamaha sound bar systems never compromise on the quality. And Yamaha YAS – 101BL is no exception. The compact yet powerful device produces extremely loud and clear sound. The clarity of sound is exceptional and you will never find it uncomfortable to hear any dialogue or any whispers. Its “Lip Sync” feature makes sure that there is no latency between the video and the audio. If you still are not happy with the loudness, you can add another subwoofer with the unit. An additional port for the same is provided. And to further improve upon the quality, Yamaha’s uni-volume technology makes it possible to maintain the same level of volume for every type of multimedia content. There are many other features that make Yamaha YAS – 101BL one of the best sound bar systems. This beautiful piece of technology and powerful compact device is compatible with most of the sound formats. No need to worry about compatibility issues with Dolby Digital or DTD digital, as they are fully supported. There is nothing better than a clear 7.1 channel surround sound and Yamaha sound bars add there extra touch to the quality. With the exceptional technology of the “air surround xtreme”, all the sound bars produce extremely realistic sound. Yamaha YAS – 101BL has a beautifully shaped curved design. Its elegant looks and sleek design are added features to its overall sound quality. It is compact and can be easily placed near a high definition TV. It’s perfectly black piano finish makes it a beautiful piece that demands appreciation. No compromise has been made to the design in order to improve upon the rest of the quality. The great design and sleek aesthetics make it a premium kind of device. The compact design of the Yamaha YAS – 101BL makes it possible to place this device anywhere near the TV. It’s slim, it’s compact and it’s a single unit that can be easily paced wherever you want to. It has the height of only four and a half of an inch, which means you can easily place it in the front of a high definition television and it will beautify the TV stand. Even after this you find any problem in placing the device then you can easily adjust the height according to your needs as the stand of the device is removable. Not happy with the results? Don’t worry there is one more solution for the placement of the device. You can also hang the device on the wall. The other most important factor that makes a device user friendly is its usability that is how easy is to learn and use the functionality of the device. We are glad to tell you that the Yamaha YAS – 101BL is one of the most usable device presents in the market. It’s built in “Learn” function makes it easier for the novice users to learn the functionality of the sound system without efforts. If you have placed the device in front of your TV then you don’t have to worry about how it is going to affect the TV remote control system. With a built in IR flasher, the signals are amplified and retransmitted to the TV so that the control is properly done. And the sound bar comes with its own remote control unit that makes it a child play to control the functionalities of the system. These are some of the features that make the Yamaha YAS 101-BL to stand tall among the other similar products in the market. High quality, affordable price, elegant looks and convenient operation are some of the key features of this amazing sound bar from Yamaha.